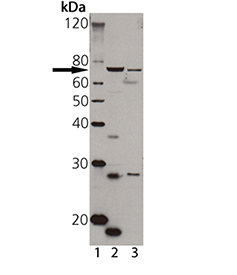 Immunogen: Synthetic peptide corresponding to a portion of human TAP1 . Scientific Background: TAP1 and TAP2 are two structurally related subunits of the Transporter associated with antigen processing (TAP). The TAP complex is a member of the ATP binding cassette (ABC) family of transmembrane transporters. The TAP transporter is an essential component of the MHC class I antigen presentation pathway by binding peptides in its cytosolic part and subsequently translocating the peptides into the lumen of the endoplasmic reticulum where assembly of MHC class I and pepide takes place. 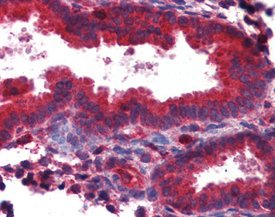 IHC Analysis: Human uterus tissue stained with TAP1, pAb at 1:100. 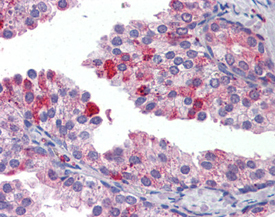 IHC Analysis: Human prostate tissue stained with TAP1, pAb at 1:100. 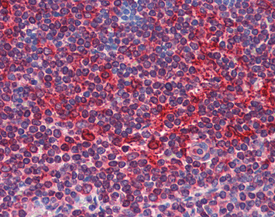 IHC Analysis: Human tonsil tissue stained with TAP1, pAb at 1:100.